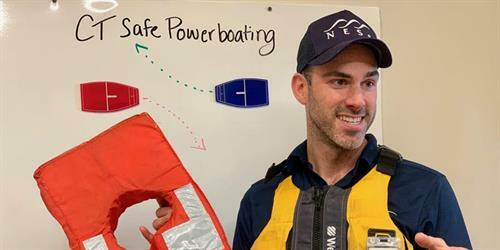 Learn the basics of powerboating at NESS and get your CT Safe Powerboating Certificate. This 8-hour course satisfies the CT DEEP classroom requirement for students to receive their Safe Boating Certificate and/or their Certificate of Personal Watercraft. Although entirely classroom based, participants get a chance to handle and work with all required boating safety equipment. The US Coast Guard, US Powerboating, and the National Association of State Boating Law Administrators (NASBLA) have approved this course. This course is taught by NESS Educators with a USCG Captains’ license. NESS Educators have thousands of hours of experience on the water with students of all ages. They make this content packed course interesting and applicable to the real boating world! Upon successful completion of the course, students will receive their Safe Boating Certificate (SBC) / Certificate of Personal Watercraft Operation (CPWO). No prerequisites are required for this course. Please be aware, this class needs a minimum of 4 participants to run. Must cancel at least 48 hours before the event starts to receive a refund.